In a climate of dire economic war/crisis and foreign aggression, Venezuelans took to the polls to elect their president and regional legislative councils. Chavismo won big in both contests, with president Maduro securing a second term until 2025. The international reaction from the US and its allies was already pre-scripted, and the dishonest coverage from the mainstream media was also to be expected. Ricardo Vaz take a look at the election, how the electoral system works, these reactions, and also share some observations after witnessing events on the ground. Incumbent president Nicolás Maduro won in a landslide, taking nearly 68% of the vote, while his closest rival Henry Falcón could only muster 21%. With all the votes tallied, Maduro totalled a little over 6.2M votes. Amidst a devastating economic crisis and increasing imperialist aggression this is a very significant victory, but it nevertheless falls very short of previous totals in chavista victories, and very short of the 10M votes that Maduro “demanded” during the campaign(1). 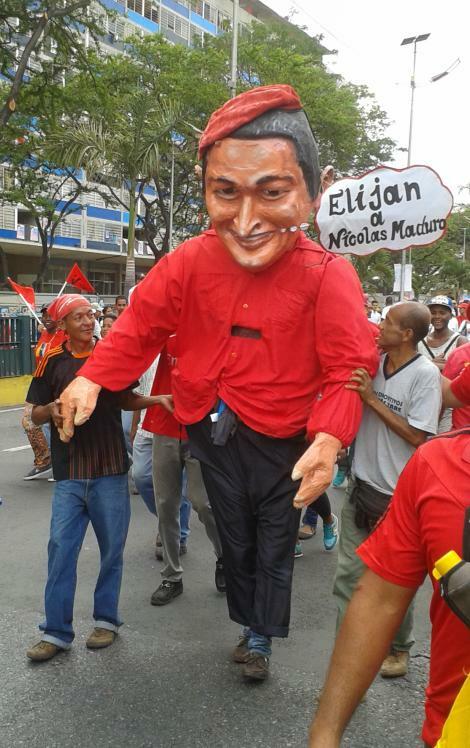 Falcón had distinguished himself by defying the mainstream opposition’s call for boycotting the elections, only to fall back to the familiar tune of not recognising the results after losing. Participation in these elections was just 46%. This number was historically low… for Venezuela! In the most recent presidential elections in Chile and Colombia, to name just two examples, participation was respectively of 49 and 48%, and nobody even floated the possibility of questioning their legitimacy. So if the low turnout is going to be mentioned, it should only be because Venezuela is (rightly) held to a higher standard than the regional US allies. We had the chance to witness the electoral process on the ground as a member of the international accompaniment mission (acompañante electoral), alongside the Venezuelanalysis team. Our observations pretty much mirrored what the results would later show. Popular and working-class neighbourhoods (barrios), such as Catia, El Valle or Petare, had a very decent turnout, starting from the early morning hours. By contrast, voting centres in middle- and upper-class neighbourhoods such as El Paraiso and Chacao, traditional opposition strongholds, had very few people. Once the voting closes the voting machine prints an act (acta) with the final tally of results, to be signed by all members of the polling station and electoral witnesses. The number of voters for example can be immediately checked against the number of signatures in the electoral roll or the number of fingerprints registered in the authentication machine. Then 54% of polling stations are randomly chosen for a “hot audit”, which is open to the public and members of the international accompaniment mission (acompañantes electorales), whereby the paper ballots are manually checked against the electronic result. And once all this is done, the data is transmitted to the CNE headquarters. This is not the whole story, as there are also plenty of audits (14 in this case) done before the elections, with members of all political parties of the international accompaniment mission present, and after the election. But just this short explanation shows you why you cannot just stuff ballots (the vote is electronic), you cannot vote more than once (authentication system will not let you and the electoral roll total will not match), you cannot just enter more votes into the machine remotely (the machines are offline except for the final transmission of results, plus the match against the paper ballots would fail), etc. More than that, members of the hundreds-strong international accompaniment mission on the ground have praised the Venezuelan electoral process as free and fair. Nicanor Moncoso, president of the Council of Electoral Experts of Latin America (Ceela), insisted that the results must be recognised because they reflect the will of the people. The existence of all these checks and audits is the reason why in over 20 elections, with constant cries of fraud whenever the opposition loses, no one has produced a single shred of evidence of fraud(2)(3), although that has not stopped the media from repeating these claims uncritically over and over. Given that in each of the thousands of voting centres the polling station members are chosen randomly and opposition witnesses are present, and they all sign an act at the end confirming that everything is in order, to claim there was fraud without anything to back it up is to take your supporters/listeners/readers for idiots. One of the most widespread allegations meant to undermine the legitimacy of the process was that someone from the CNE told Reuters that by 6 PM participation was just 32.3%. This is a pure fabrication, as any of the hundreds of acompañantes who were on the ground could have told any of these outlets if asked. Simply put, the CNE does not publish preliminary data because it does not have access to it. Only when when all the audits (to 54% of voting centres) have been completed and a sizeable number of voting centres have transmitted their numbers, so as to make the results irreversible, are the figures made available. So this claim might as well have been made by the Queen of England. It is akin to writing a headline “caveman source claims that the Earth is flat” when the Earth’s curvature has been measured. It is giving credence to random allegations about a number that has actually been measured and audited. And going back to what we said before, given such a large discrepancy and the large number of people involved, surely there would be ONE piece of evidence about ONE voting centre where the final tally had supposedly been inflated. In the absence of hard evidence to back up fraud claims, the discourse is shifted towards other “irregularities”. While this is just small sample hearsay, opposition electoral witnesses did not report any irregularities when talking to us, although they did expect a low turnout from opposition voters. Some did complain that the puntos rojos were closer than the stipulated 200m, but laughed at the notion that voters would change their mind or be turned into zombies by the sight of red canopies. In fact, these puntos rojos have been present in elections for the past 20 years, and used to have their opposition-coloured counterparts across the street. These places mostly serve as gathering points as people wait for the voting to unfold, and more importantly to track participation from their ranks, to see if further mobilising is necessary or not. The notion that these were a factor in the results, embraced hysterically by Falcón and his team and then echoed by the media, reeks of desperation. Other complaints, such as assisted voting (people helping elderly voters) irregularities were also insignificant in terms of their relevance for the final numbers. The international reaction was no surprise because it was already pre-determined before the elections. Such is the absurdity and dishonesty when it comes to Venezuela. And at this point it makes no sense to distinguish the reaction of the US State Department and the ones from its multiple echo chambers, be they spineless allies like the self-appointed Lima Group and the EU or the propaganda outlets of the mainstream media. 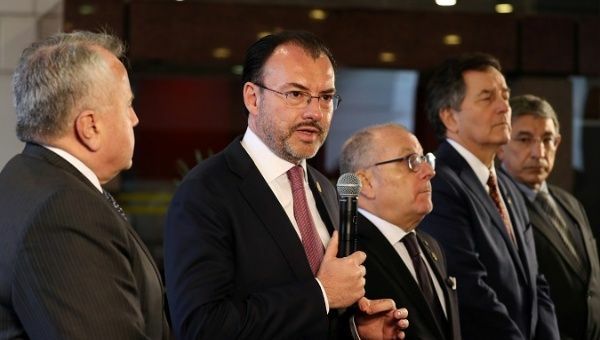 After the opposition MUD delegation walked away from the negotiating table with a deal already hammered out (according to former Spanish PM and mediator Zapatero), allegedly under US orders, the US quickly moved to announce that the elections would be fraudulent and illegitimate, its results not recognised, and all the usual suspects followed suit. 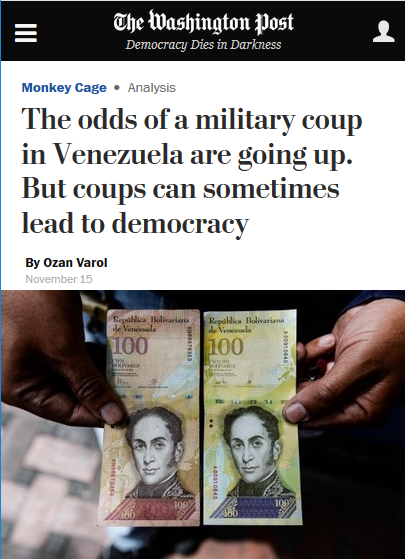 And that is precisely what happened after Maduro’s victory, with people who claim to be champions of democracy vowing to punish Venezuela for the unforgivable crime of holding elections. We have dedicated plenty of efforts to deconstructing the mainstream media propaganda surrounding Venezuela, and elections in particular, but it feels more and more like a waste of time. People that truly want to be informed about Venezuela should simply look for sources that do more than repeat the State Department talking points or uncritically echo the allegations of the Venezuelan opposition. FAIR did an excellent job of pointing out how even the MSM headlines have become unanimous, with “amid” their new favourite preposition. It is fair to say that amid so much propaganda, there is very little actual journalism left. It would serve us well to go back a few months to the Honduran elections. Here there was actually plenty of evidence of fraud, which allowed for an irreversible trend to be reversed in order for the US-backed incumbent Juan Orlando Hernández to secure victory. Despite a few protests and some tame calls for holding new elections, the fraudulent winner was eventually recognised and it is now business as usual. Believe it or not, Honduras is part of this Lima Group that has the nerve to question the legitimacy of the Venezuelan elections. Had the reaction been just this shameful bombast it would not be much of a problem. But it came followed by the tightening of the economic noose around Venezuela, i.e., new sanctions. The latest round of sanctions imposed by the Trump administration again fell short of an oil embargo, which has been increasingly floated by US officials, but targeted Venezuela’s and PDVSA’s ability to collect and re-finance debt. So from an international perspective the elections did not change much, perhaps accelerating the aggression we had been seeing. But on the inside the picture is different. There were very clear signs, whether the loud cries from those who voted or the loud silence from those who did not, that the current economic situation needs to be dealt with, and fast. We already know what the solution would be if the right-wing returned to power, electorally or otherwise. The question is whether amidst this international siege the Bolivarian government has enough resources and political will to radicalise their path. (2) Perhaps we should clarify that no credible evidence has been produced. After the 2013 elections defeated candidate Capriles produced a dossier of “evidence” that was mercilessly torn to shreds, because none of it held any water. (3) A possible notable exception was the gubernatorial election in the State of Bolívar this past October. Defeated candidate Andrés Velázquez published alleged acts that differed from the results on the CNE website, but this matter was not pressed further, perhaps because it undermined all the other unproven fraud claims. 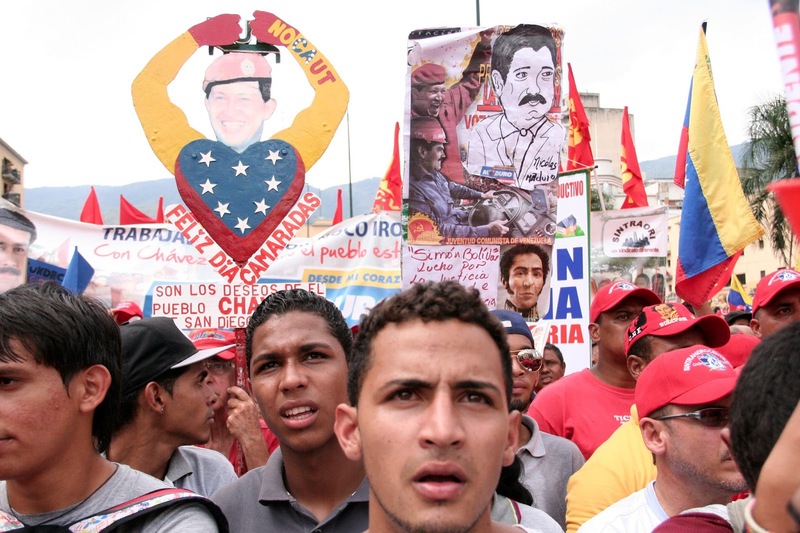 While the Venezuelan opposition’s fraud claims following President Maduro’s reelection triumph hold little water, the Bolivarian Revolution stands at the most critical crossroads of its history. Another election in Venezuela and once again the country’s right-wing opposition has cried fraud with the full backing of Washington and its allies. On Sunday, Venezuelan President and United Socialist Party (PSUV) candidate Nicolas Maduro won re-election to a second six-year term with nearly 68 percent of the vote and the backing of virtually all of the left-wing parties in the country. Despite signing an agreement in March to recognize the results, opposition frontrunner Henri Falcon has called the vote “illegitimate”, demanding new elections in October. The latest post-election fraud allegations are anything but surprising. They have become the featured act of an all-too-familiar routine repeated by the Venezuelan opposition in 2004, 2005, 2013, and 2017, often with no or extremely sparse and dubious evidence. Nonetheless, the mainstream corporate media shows no sign of boredom, giving headline after headline to this now tired charade. What was indeed unusual, if not exceptional, about Sunday’s election was that the claims of fraud began three months before the vote even took place. In February, Venezuela’s main opposition coalition, the Democratic Unity Roundtable (MUD), announced its decision to boycott the upcoming elections, arguing that the April 22 date was “too soon” and the guarantees negotiated with the government in Santo Domingo were “inadequate”. The US and its right-wing regional allies in the 14-nation “Lima Group” quickly followed suit, preemptively refusing to recognize the election result. Ironically, the boycott, justified on the grounds that the election date was too soon, was announced a little over six months after the MUD’s failed campaign of violent anti-government protests demanding early presidential elections, which led to over 125 deaths between April and July 2017. 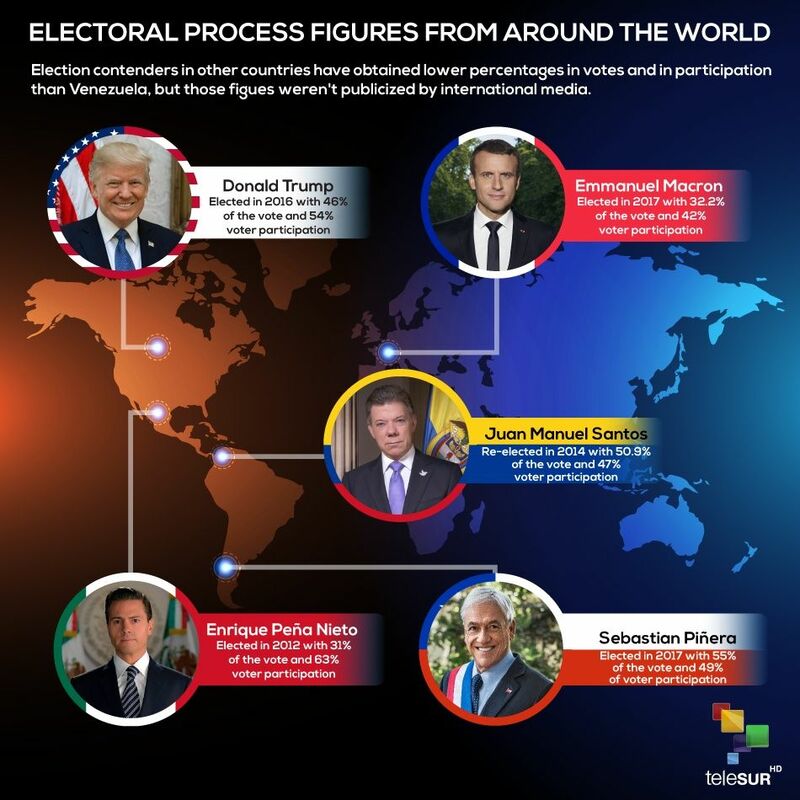 At the time, the US State Department, OAS Secretary General Luis Almagro, and other regional conservative governments issued repeated calls for 2018 presidential elections to be brought forward. 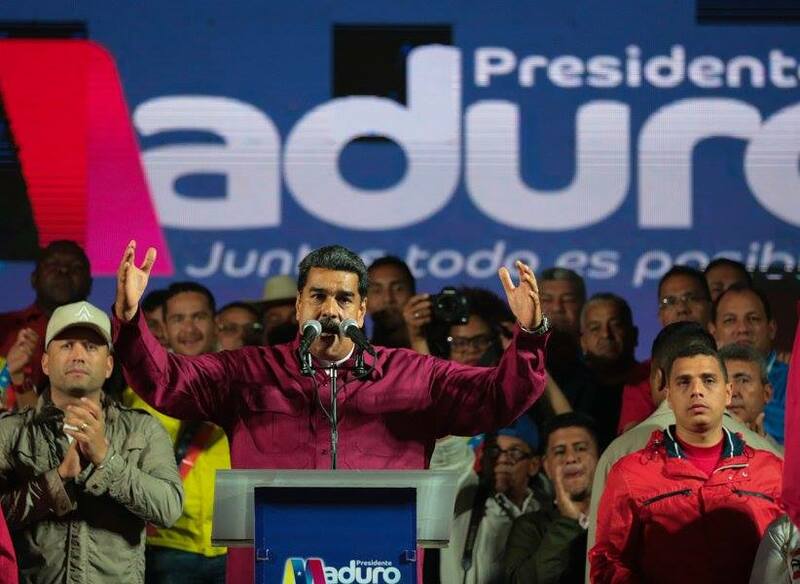 In a bid to appease the MUD and its sponsors in Washington, the Maduro government agreed in March to move the elections back to May 20, signing an agreement with right-wing candidates Henri Falcon and Javier Bertucci that included a host of electoral guarantees. In response, the MUD only hardened its stance. Former National Assembly President and 2002 coup veteran Julio Borges embarked on a seemingly non-stop international tour lobbying governments throughout the world not to recognize the elections and urging tough sanctions against Venezuela. As far as US geopolitical imperatives go and their absolute preponderance over international law and democratic norms, it’s clear that very little has changed over the last 48 years. As in the past, the latest “sham” allegations hold little water. Both Falcon and evangelical candidate Javier Bertucci have claimed that the ruling United Socialist Party’s “red spots” were used to buy votes and coerce voters. 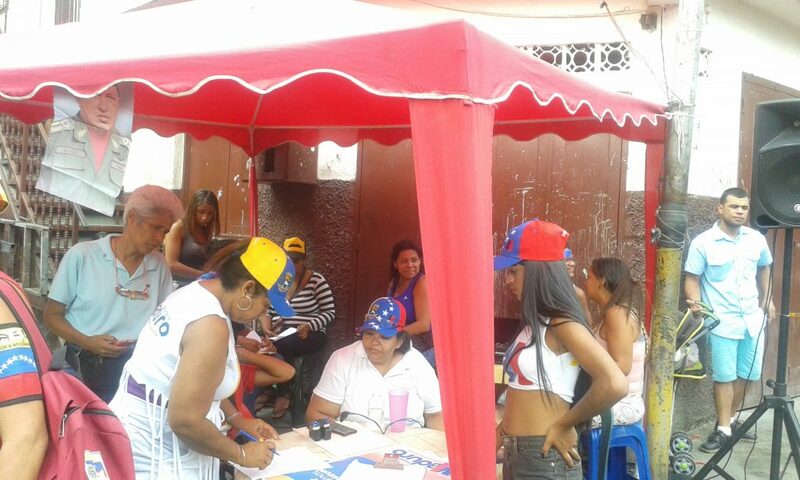 A standard feature of the PSUV’s grassroots mobilization strategy for years, “red spots” are kiosks set up near electoral centers where pro-government voters are encouraged to check in after voting for the purposes of tracking party member participation. They are also used to coordinate internal party logistics such as getting water and food to their electoral witnesses at every center as well as providing transport for those with mobility problems. It is true that Chavistas scan their government-issued Homeland ID Card, which is also used to coordinate state social programs such as the CLAP food distribution network. However, voting is secret in Venezuela and there is absolutely no way for the PSUV to know how those scanning their cards voted – a fact conveniently omitted by the New York Times in its description of the “red spots”. 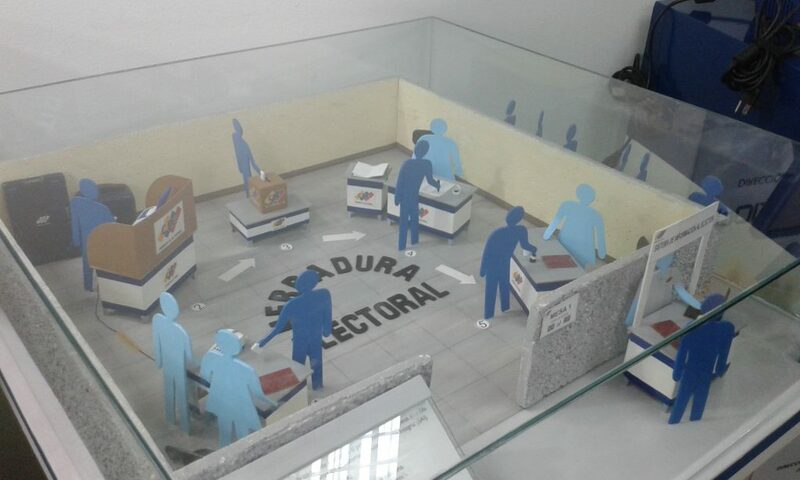 Moreover, the PSUV is hardly unique in its use of “red spots”; opposition parties, particularly larger ones with nationwide mobilization capabilities, routinely deploy their own kiosks close to polling stations for similar purposes. In fact, when we visited Petare’s 5 de Julio neighborhood during October 15 regional elections, the right-wing First Justice party had a yellow kiosk even closer to the voting center than the PSUV’s “red spot”. In the course of VA’s exclusive on-the-ground coverage of Sunday’s vote, we visited numerous polling stations throughout Caracas where we spoke with witnesses for the PSUV as well as the opposition parties. Venezuela’s electoral process is unique insofar as all participating candidates have the right to deploy their own witnesses in all electoral centers. These witnesses monitor the process to ensure that legal norms are upheld, and at the end of the day they have access to paper copies of the vote tallies from each voting machine, which can be cross-checked with the electronic results sent to the headquarters of the National Electoral Council (CNE). None of the opposition witnesses we spoke with reported any irregularities. “I have not seen any irregularities,” said Pablo Milanes, a witness for the pro-Falcon Movement Towards Socialism party at the COECO5 voting station in the 5 de Julio neighborhood in Petare, eastern Caracas. Concerning the “red spots”, Milanes complained that the local PSUV kiosk was “too close” to the voting center according to CNE norms but denied that it impeding citizens’ right to cast their vote. “Every person is responsible for their actions. People will come out to vote if they want to come out to vote,” he told us. Ironically, Falcon was joined in his hysteric “red spot” diatribe by his economic advisor Francisco Rodriguez. Back in October, Rodriguez’s Wall Street investment bank Torino Capital issued a report roundly refuting the MUD’s fraud claims in regional elections, which saw the PSUV take 18 of 23 governorships. The most important driver of the opposition’s loss appears instead to be its inability to get out its voters… The data thus suggests that opposition supporters were not motivated to vote in this election. The concrete calls to boycott the election on the part of some vocal leaders may have adversely impacted opposition turnout. In the October 15 elections, the PSUV likewise made use of “red points” as one of the elements of its formidable ground game, throwing to the wind any notion that this tactic had a substantial impact on outcome. They also used them in precisely the same manner in the 2015 parliamentary elections, in which the opposition won a landslide victory and, for a change, did not cry fraud. In fact, the only major difference between October and this past Sunday was the extent of opposition abstention. In October, the opposition lost 2.1 million votes relative to its watershed 2015 parliamentary victory with 7.1 million votes – a 30 percent decline. On Sunday, the opposition garnered approximately 3 million votes, constituting a further loss of 2 million votes with respect to October and a nearly 58 percent fall compared to 2015. Abstention was highest in the opposition’s traditional upper middle-class bastions, such as Chacao and Las Salias in Miranda State, where turnout was 13.87 and 18.83 percent, as well as in areas which have seen significant emigration in recent months, such as Merida and Tachira State. While Venezuelans outside of Venezuela are able to vote, they must be registered and hold a visa for their resident country, a requirement which the majority of temporary emigrants do not fulfill. This recent drop in voter turnout even marks a steep drop in comparison to December municipal elections, which were likewise boycotted by the main opposition parties when participation was 32.02 and 38.3 percent in these municipalities. The bottom line is that Rodriguez’s analysis holds true today as much as in October, namely that it was mass abstention, not any irregularities, that doomed Falcon’s presidential bid. Last year, Venezuela’s right-wing opposition likewise claimed that July 30 National Constituent Assembly elections were fraudulent on the grounds that the turnout of over eight million voters was “too high” to be credible. This came after a violent four-month long anti-government insurrection led by the main parties of the MUD, which saw 200 polling stations besieged on election day. Now, the MUD claims that the Sunday’s presidential election is illegitimate because too few people voted, namely on account of the high abstention which they themselves promoted. Unable to win a majority at the polls due to their disastrous string of strategic blunders – ranging from violent protests to electoral mobilization to blanket boycott – the right-wing parties of the MUD have desperately sought to construe Sunday’s 54% percent abstention as an endorsement of their radical regime change agenda. Nothing could be farther from the truth. A February Datanalisis poll found that just 31.7 percent of Venezuelans have a positive view of the MUD, a precipitous decline from 59.7 percent in October 2016. While the opposition coalition has been effectively collapsed into the Free Venezuela Broad Front in a concerted rebranding effort, its leaders remain overwhelmingly unpopular. The same February poll gave Julio Borges an approval of just 29.3 percent, while Henrique Capriles and Leopoldo Lopez stand at 30.8 and 40.4 percent, respectively. It’s worth noting that Capriles and Lopez are routinely presented by the international media as guaranteed victors if they were allowed to run against Maduro, but neither surpasses fifty-percent popularity. Pardoned by Chavez in 2007 for their prominent roles in the 2002 US-backed coup, Lopez was sentenced to 13 years imprisonment for leading 2014’s violent anti-government protests, while Capriles was barred from running by the Comptroller General’s office over corruption allegations. Both are deeply divisive figures and it’s far from certain that they would have been able to unite the bulk of the opposition behind them, let alone win over enough independents and disillusioned Chavistas necessary to triumph. Moreover, Sunday’s 46 percent turnout and Maduro’s approximately 31.25 percent vote share of the total electorate are by no means unusual by regional standards. Lest we forget that in 2016 Hilary Clinton garnered just 32.9 percent of all registered voters, while Donald Trump won 31.49 percent. Faced with the two most unpopular candidates in US history, the true 2016 presidential winner was abstention. Similarly, Colombia’s Juan Manuel Santos and Chile’s Sebastian Piñera were elected with 24.39 (2014) and 23.98 percent (2017), respectively, with turnout standing at 47.89 and 44 percent. In uncritically repeating the Venezuelan opposition’s canard regarding abstention, the international media once again reveals its shameful double standards, conveniently glossing over US-backed regimes with much less of a democratic mandate than Maduro, including what are effectively un-elected dictatorships in Honduras and Brazil. However, while contextualization is necessary, Venezuela cannot be compared to “low intensity” bourgeois representative democracies like the United States, Chile, or Colombia given that the project of the Bolivarian Revolution is precisely to overcome the capitalist state’s inherently anti-democratic institutional framework in favor of radical communal forms of self-government. Not for nothing does the 1999 Bolivarian Constitution define Venezuela as a “participatory and protagonist democracy” in an open invitation to the country’s poor Afro-indigenous majority in the countryside and shantytowns to take the reigns of the state and public life generally for the first time since the nation’s founding. A key aspect of this new popular sovereignty has manifested itself at the ballot box, with the Venezuelan masses finally achieving under Chavez an electoral system that not only enfranchises them but guarantees beyond all doubt the will of the majority. This strikes a sharp contrast with countries like the US, Mexico, or Honduras, where popular majorities are regularly suppressed through institutionalized anti-democratic mechanisms and/or outright vote rigging. Given that the Bolivarian process depends on the continual bottom-up mobilization of a progressively politicized Chavista majority, both in the active constructive of new institutions of people’s power as well as in defense of existing gains in the streets and at the ballot box, Sunday’s results must be read as a clear warning sign. 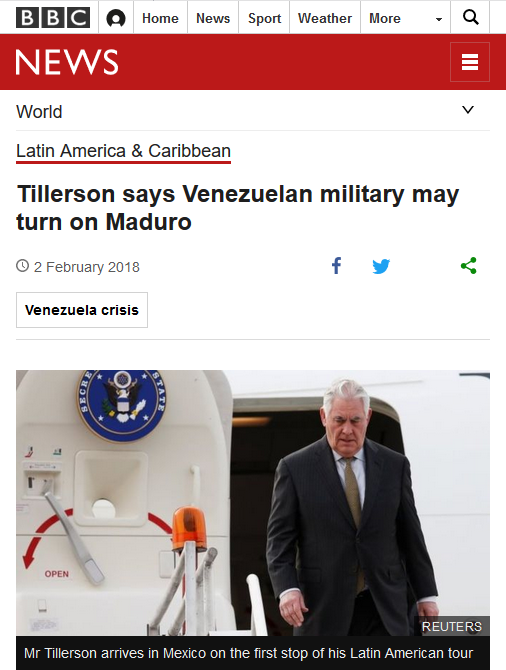 On the one hand, there is no doubt that May 20 was a popular victory, in which the Venezuelan people, faced with severe sanctions imposed by Washington in tandem with an open opposition destabilization effort, defied the Empire and voted massively for continuing the Bolivarian revolutionary sequence. 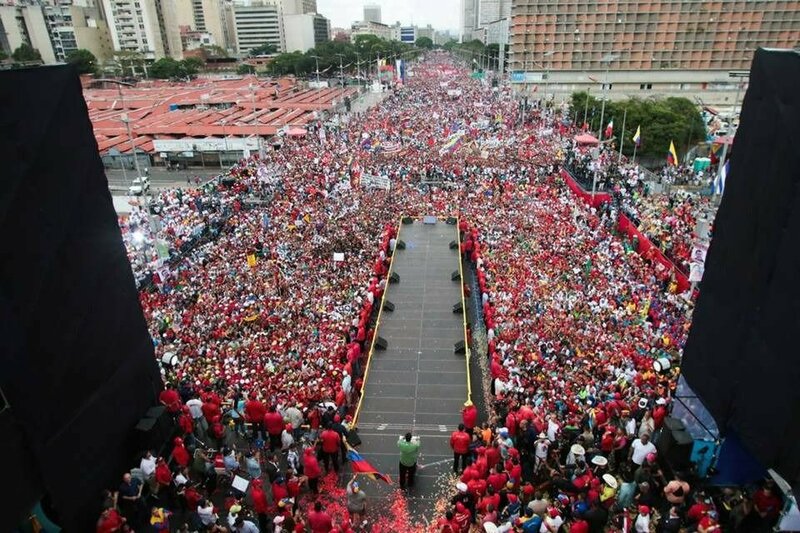 Moreover, contrary to the mainstream media narrative that all-together denies the existence of Chavistas or reduces their political subjectivity to a paltry cash bonus, the 6.2 million who voted for Maduro amid economic crisis and international blackmail did so in order keep alive the flame of the revolutionary experiment, demonstrating that another world is indeed possible. “Today is important, in spite of all the international attacks against us, the people continue to mobilize. 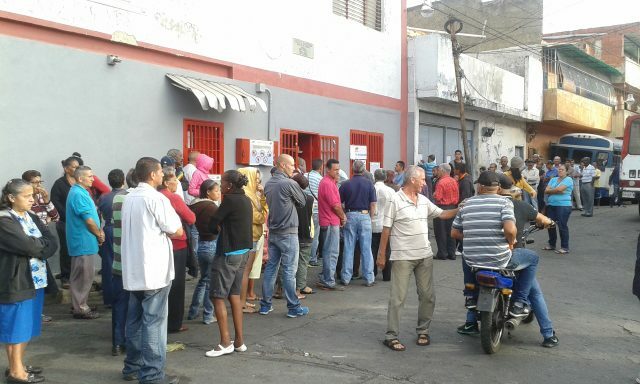 The central issue is organizing for a different kind of state, which was Chavez’s proposal, a state where we all participate,” explained Guilda Mercado after voting in the Isiaias Medina neighborhood in the working class western Caracas sector of Catia. But on the other hand, May 20 was irrefutable evidence that four years of deep economic crisis – to which the Maduro government has yet to offer a substantive, structural response – has exacted its crushing political toll. As Venezuelan writer Nestor Francia observes, Maduro received on Sunday 1,341,717 less votes than the 7,587,579 he received in 2013, despite the electorate having grown by around two million in the interim. Even more revealing, the incumbent received 1,063,218 less votes than Chavez garnered in 2006, when there were approximately four million registered voters. In total, we can conclude that the government has lost 1,945,270 votes since Chavez’s high water mark 2012 reelection victory, in which he won 8,191,132 votes. In this context of eroding support, Sunday’s victory could very well prove pyrrhic if it does not heed the demands of popular movements to adopt a revolutionary program for overcoming the crisis, such as that proposed by the Bolivar and Zamora Revolutionary Current. It’s true that we have had to face the ravages of the economic war and the sabotage (and bureaucratism, corruption, and inefficiency), but the people say in the streets: War is war, either the government runs or it stands and fights! The people don’t want promises of future paradises; they want actions, deeds, realities. The only certainty is that with Trump’s latest economic sanctions and threats of an oil embargo, this war is set only to intensify. CRBZ: We Won! And Now What? The Bolivar and Zamora Revolutionary Current (CRBZ), a grassroots revolutionary organization with strong campesino work, analyzes the post-May 20 scenario and proposes a plan to get out of the current crisis. We won. Those are the first words we should utter. Given the circumstances that we were faced with, this is a remarkable feat. We confronted the opposition candidates, and we soundly defeated them. Likewise, we fought against the campaign of those who, backed by the United States and its allies, called for abstention. The conditions of this electoral contest – the fourth in less than a year – were difficult not only in the political arena, but also materially and existentially. The people carried out a historic feat, and, as a result, we won again. The difference in votes between our candidate Nicolas Maduro, his second contender Henri Falcón (more than 4 million votes), as well as with the third contender Javier Bertucci is evidence of our strength, our social base, and our indispensable unity. Our opponents were defeated at the polls, with Falcon rapidly announcing that he will not recognize the results, giving fodder to the abstainers’ claims of “fraud” and deepening the opposition’s conviction that the only road to success is through force. 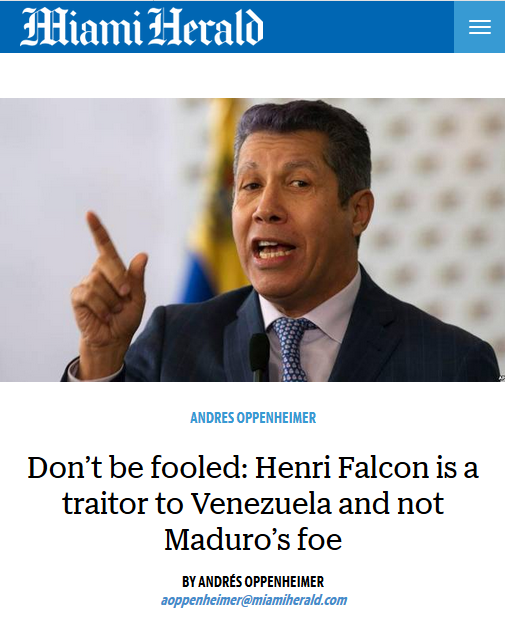 By crying fraud, Falcon has only bolstered the line that was already written before the elections: cries of fraud followed by more international, economic, and diplomatic sanctions. However, we also need to analyze the levels of voter participation. Measured in international terms, the numbers compare favourably with patterns of participation in the American continent or in Europe. On the other hand, if we take Venezuelan elections as our base, we must acknowledge that participation was indeed much lower than in the last presidential elections (though it remained stable when compared with the elections of mayors and governors). The explanation for this is twofold. First, there is the local and international abstention campaign from right-wing sectors. Secondly, people’s daily economic situation has deteriorated and there is political discontent due to the behavior of a large sector of the establishment. There were barrio dwellers and peasants that didn’t vote, not because they have moved away from Chavismo or stopped believing, but because they were immersed in solving their day-to-day problems. This indicates a key challenge that the nation must confront: recovering lost votes, which must really be thought of as recovering majority support and hegemony. That means going back to Chavez’s way of doing politics and responding immediately to the people’s grave economic problems. With this in mind, we call for the implementation of a National Emergency Plan made up of deep, unconventional and revolutionary measures. We believe that the whole of the country’s energies should be focused on four areas with short, medium and long-term goals. This plan must be carried out with complete transparency. The processes and mechanisms that are used in the debates and in developing diagnoses, studies and analyses must be publicised, and the implementation must happen publically under the whole nation’s scrutiny. The reconstruction of the public sphere and its ethics must be one of our main objectives, as well as the active participation of organized popular sectors in the whole process from diagnosis and planning to execution and supervision. 1- Food production: Prioritizing staples in accordance with the nutritional needs of the country. We propose reprising land reform, which is a necessary condition for recovering our agricultural production. We need to be true to a revolutionary principle that more or less sums up Chavez’s agrarian legacy: the land belongs to those who work it. In turn, a financing plan must be developed for all sectors that produce, focusing now on the primary producers. With this in mind, it is urgent to reign in the private banks that manage the savings of all Venezuelans in a willy-nilly way, and which currently favor agroindustry and other sectors. Another key issue in regards to food production is to carry out a transparent audit of state-run agricultural enterprises, calling for the immediate replacement of management teams that head unproductive companies. 2- The national electrical system also requires a thorough review, as does the communicational platform (telephone and internet). The management teams responsible for these areas must undergo a strict and transparent evaluation, in which the workers participate directly. A plan based on economic efficiency and improved performance must be developed, and it has to include co-management with organized communities: the blueprint for this plan will have to include funding for the production and distribution of up to date technology, provisions for system and platform maintenance, as well as a plan to improve the working conditions in these sectors. 3- Developing a plan for the improvement of the national public healthcare system, focusing on the recuperation of central and municipal hospitals, is urgently needed. It must include the renovation of infrastructure (especially areas such as emergency rooms, operating rooms, and hospitalization) in addition to the full restocking of medicines, surgical materials, and ambulances. Last but not least, there must be a salary hike for all medical center staff, from the doctor and the nurse to the janitorial personnel. 4- A recovery plan must be implemented for the national school and university system involving better school infrastructure and a thorough policy to protect educators’ real salaries, encouraging them to remain in the country. The education plan must also include the recovery and expansion of the free school lunch program. The National Emergency Plan must be the result of a broad debate involving all sectors that are committed to the nation, and it must transcend political and ideological barriers. It must be taken up as a joint effort by the people and the government for the nation’s sake. An honest and realistic perspective is needed to address the huge economic crisis that affects popular sectors and the lower-middle class. We are aware of the financial difficulties that the nation is facing, but we are also conscious of the enormous resources that are being wasted and squandered daily due to inefficiency and incapacity to prioritize, as well as a lack of planning and thriftiness, not to mention the high levels of corruption in the public administration. Any sort of plan must eliminate the privileges of the bureaucratic and governing classes in the administration and PSUV leadership, who have become elites that live worlds apart from the grave problems and profound suffering that the Venezuelan people are now experiencing. We put forward this proposal following an electoral victory in the midst of a critical economic situation that calls for an urgent response based on an attitude of revolutionary realism. Now that we have achieved this indispensable victory, we cannot wait any longer, we must rectify and deepen the process. We are standing up to imperialism and its allies (the oligopolies, the oligarchy, etc), indeed Chavismo must confront them, but at the same time must give an answer to those who need it. This is the message which we hear from the shantytowns, from the countryside, and from the coast, from the millions of ordinary men and women who make up this nation. Translated by Cira Pascual Marquina for Venezuelanalysis. 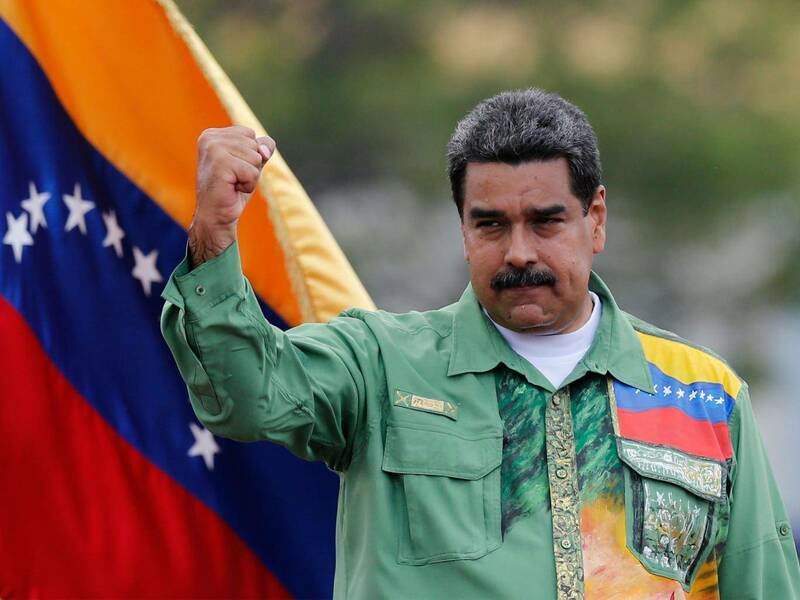 Perth Indymedia – Nicolas Maduro’s government in Venezuela has come under increasing attack from both Western governments and the international capitalist press. With prices doubling every month and poverty reportedly on the rise after years of social improvement for the mass of the people, the Maduro administration also faces fierce criticism from at least some elements of the left. Journalist, political commentator and co-author of Latin America’s Turbulent Transitions: The Future of Twenty-First Century Socialism, Federico Fuentes, addressed the question of whether this latest election was illegitimate or even rigged, as claimed by much of the Western press. Lucas Koerner, Caracas, May 21, 2018 (Venezuelanalysis.com) – Venezuelan President Nicolas Maduro was elected to a second term Sunday with 6.2 million votes, beating out his closest rival Henri Falcon, who garnered just 1.9 million votes. Venezuela’s National Electoral Council (CNE) announced the result shortly after 10pm Sunday evening, revealing that Maduro had won with 67.79 percent of all votes cast, ahead of opposition contenders Henri Falcon, Javier Bertucci, and Reinaldo Quijada, who won 21.01, 10.82, and 0.39 percent, respectively. Despite a boycott by the main opposition parties of the right-wing Democratic Unity Roundtable (MUD) coalition, turnout was 46 percent, with 9,085,629 of Venezuela’s 20,527,571 registered voters casting ballots. “The people have decided,” she told the nation. On Monday an international observer mission led by the Council of Electoral Experts of Latin America (CEELA), comprised of former top electoral officials from throughout the region, said the election was clean. “Technically, up until today, we have not observed any element that could disqualify the electoral process,” said CEELA President Nicanor Moscoso in a press conference. “We can emphasize that these elections must be recognized, because they are the result of the will of the Venezuelan people,” he added. Prior to Sunday, CEELA observers participated in all fourteen of the pre-election audits conducted by the CNE in conjunction with all participating political parties, in addition to overseeing the “hot audit” of 54.4 percent of all voting machines mandatorily carried out on election day. Faced with a clear defeat at the polls on Sunday night, opposition presidential frontrunner Henri Falcon refused to recognize the results. Prior to the announcement of the official results, the former Lara State governor gave a press conference, in which he called the vote “illegitimate,” demanding new elections in October. “We do not recognize this electoral process, and we brand it as illegitimate,” he stated. In particular, Falcon accused the government of violating a series of electoral guarantees agreed to in March through the use of “red points”, which are kiosks set up by United Socialist Party activists near electoral centers where pro-government voters are encouraged to check in after voting for the purposes of exit polling. The opposition candidate did not, however, specify how the use of “red points”, which has been a standard feature of the ruling party’s mobilization strategy for years, affected the election result. “I call on all of the presidential candidates who participated in the election of May 20… to a meeting for dialogue in order to establish a constructive agenda,” he said on Monday. The call for dialogue was seconded by former Spanish Prime Minister Jose Luis Zapatero, who offered to mediate any future talks. Zapatero, who facilitated the previous round of government-opposition dialogue in the Dominican Republic in January, said that Sunday’s vote had gone forward “peacefully” and opposition candidates should direct any complaints they have regarding the electoral process through the appropriate institution channels. “Venezuela’s election was a sham ­— neither free nor fair. The illegitimate result of this fake process is a further blow to the proud democratic tradition of Venezuela,” he stated. The vice president did not, however, cite evidence to support the allegations of fraud. Following Venezuela’s announcement of presidential elections this past February, the Trump administration has repeatedly made clear its refusal to recognize the vote, despite the Maduro government agreeing to a series of electoral guarantees with opposition parties, including moving up the date to May 20, among other agreements. Sunday’s result was similarly rejected by the bloc of regional right-leaning governments known as the “Lima Group,” which includes Argentina, Brazil, Canada, Chile, Colombia, Costa Rica, Guatemala, Guyana, Honduras, Mexico, Panama, Paraguay, Peru, and Santa Lucia. In a statement released Monday, the group vowed to recall their ambassadors to Caracas for consultations and present a new resolution on Venezuela at the next meeting of the Organization of American States. The 14-member bloc additionally resolved to “coordinate actions in order that international and regional financial organisms do not grant loans to the Venezuelan government” in a bid to increase the pressure on the re-elected Maduro administration. Meanwhile, Maduro’s victory was recognized by a number of close Venezuelan allies, including Cuba, Bolivia, El Salvador, Iran, Russia, and Nicaragua. “The parties involved must respect the decision of the Venezuelan people,” said Chinese Foreign Ministry spokesman Lu Kang at a press conference in Beijing on Monday. Maduro will be formally sworn in on January 10, 2019, when his six-year term officially expires. TeleSUR English – The U.S.-alligned Lima Group and the EU are following in Washington’s footsteps with aggressive policies against Venezuela. The U.S. State Department had announced earlier Monday that President Donald Trump put in place new economic sanctions aimed at Venezuela in an executive order banning U.S. citizens from being involved in sales of that country’s accounts related to oil and other assets. “Venezuela’s election was a sham – neither free nor fair,” U.S. Vice President Mike Pence said shortly before the sanctions order. “The United States will not sit idly by as Venezuela crumbles and the misery of their brave people continues … The Maduro regime must allow humanitarian aid into Venezuela and must allow its people to be heard,” he said. In a separate statement, Secretary of State Mike Pompeo said the United States “will take swift economic and diplomatic actions to support the restoration of their democracy.” He did not elaborate. And in a series of tweets written in English and Spanish, the infamous Senator Marco Rubio called the Venezuelan elections a “fraud” and even said there was no electoral exit while the Bolivarian revolution is in power, echoing previously declarations in which he directly called for a military coup. “The only mafia in Venezuela is its regime. Today is the beginning of its end,” tweeted Rubio. “The condemnation of the international community is loud and clear. We shall work closely with our EU and regional partners in the coming weeks to determine how we can continue to support a political resolution,” said Johnson. The controversial foreign secretary claims he was “deeply concerned by the man-made humanitarian and economic crisis, which is growing worse by the day” and urged the Venezuelan government to take immediate action and let international humanitarian aid to deliver food and medicines, but didn’t mention anything about the increasing sanctions on the Bolivarian revolution that have hampered their efforts to stabilize the economy. Also in Europe, the Spanish Prime Minister, who has led EU efforts against Venezuela, expressed his rejection to Sunday’s elections. “Venezuela’s electoral process has not respected the most basic democratic standards. Spain and its European partners will study appropriate measures,” tweeted Prime Minister Mariano Rajoy. Meanwhile Venezuela’s neighbors led by right-wing governments issued a statement under the banner of the so-called Lima Group said it did not recognize the vote and would downgrade diplomatic relations with Venezuela. The group deplored Venezuela’s “grave humanitarian situation” and vowed to help crack down on corruption and block loans to the government. May 17 marked the end of the political campaign for the upcoming presidential and legislative council elections, that will take place on Sunday May 20. In Caracas, in the traditional rally-holding place in Avenida Bolívar, Nicolás Maduro gave his closing campaign speech, surrounded by a large crowd that had mobilised in the early hours of the morning and converged from multiple locations in Caracas. 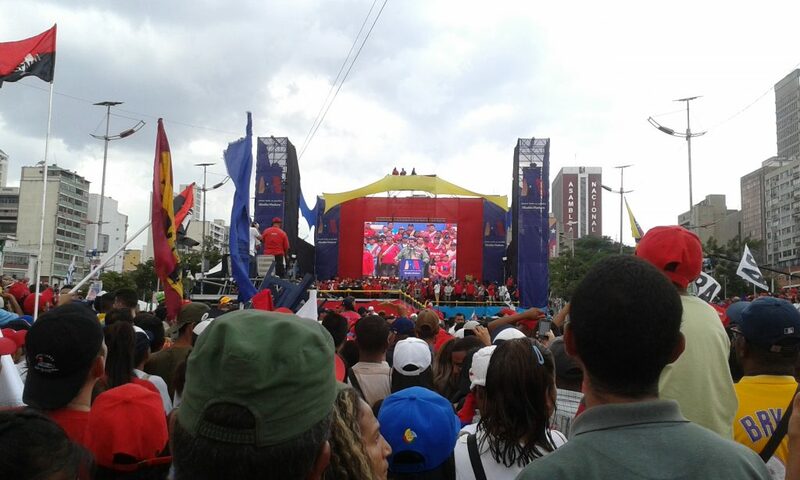 Ricardo Vaz, Investigaction – In his speech, Maduro reiterated some of the main tenets of his campaign: the promise to take on the economic “mafias” and to bring forth an “economic revolution” (1), the rejection of foreign interference in Venezuelan affairs, and a call for participation in the upcoming elections. He also renewed a call for dialogue addressed to all sectors of Venezuelan society. This final rally brought the curtain on a campaign that saw Maduro all over the country, supported by what has become an impressive electoral machine, with a big ability to mobilise people. Multiple sectors inside the heterogeneous chavismo also voiced their support for Maduro. Even groups that have kept a critical line with regard to government policy in recent times have it clear that only a Maduro victory can guarantee the continuity of the Bolivarian Revolution and the possibility to continue the struggle for socialism. 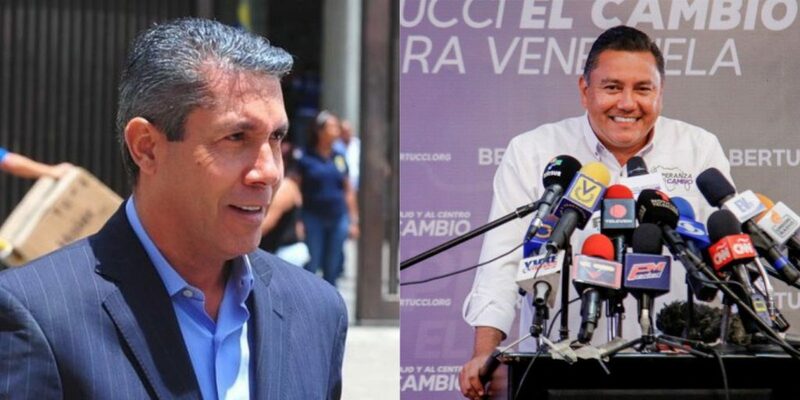 The two main opposition candidates on 20M are Henri Falcón and Javier Bertucci (out of the other two initially running, Reinaldo Quijada is expected to have a very small showing and Luis Ratti joined Falcón). For a while the possibility of a unified front with a single candidate hung in the air, but did not materialise in the end, which makes Maduro the favourite for the upcoming vote. Henry Falcón “disobeyed” instructions and threats from the US and the main opposition parties of the MUD, stepping forward as a candidate. His main proposal is to dollarise the economy, as well as appeal to instances such as the World Bank and the International Monetary Fund for support. However with the main anti-chavista figures and parties insisting in their non-recognition of the elections and calling on people to stay away, he will find it hard to mobilise the middle class, which historically has been the core anti-chavista vote. While Falcón focused mainly on holding meetings and press events, evangelical pastor Javier Bertucci made use of his experience and mobilising capacity to hold a few massive events on the streets. Bertucci refused to step out of the race in favour of Falcón, believing (or having us believe) that he is in a better position than his rival. In any case, his arrival on the political scene is surely with a view beyond these elections, looking to capitalise on the disastrous decisions of the opposition in the recent past to present himself as a political alternative in the future, in a similar fashion to what has been seen with evangelical movements in other Latin American countries. These elections arrive with Venezuelan suffering from a deep crisis and growing economic war. Prices have skyrocketed in recent months, and the government response through salary increases and bonuses has failed to keep up with inflation, resulting in a very difficult reality for ordinary Venezuelans. There is also an important international dimension to this. The US empire, and its loyal allies, have been ramping up the attacks against Venezuela, for example barring all access to credit or making it more difficult to pay for imports. Along these lines, the US and its echo chamber, the Lima Group, have railed against these elections, arrogantly demanding they be suspended and announcing, months in advance, that they would not be legitimate and that they would not recognise the results (2) (3). This is simply a consequence of the fact that an anti-chavista victory was far from certain. After a growing wave of violence in the first half of 2017, chavismo responded with remarkable strength, achieving peace with the Constituent Assembly elections and then going on to win regional and municipal elections. In light of all this, the decision was to abandon the electoral route and look for a different “regime change” avenue. Taking all of this into account, the 20M elections are a key moment in the history of Venezuela and Latin America. A chavista defeat would imply a massive setback for the left in Latin America, and it would bring about a merciless onslaught against poor and working-class Venezuelans. But at the same time a Maduro victory will be greeted with even greater imperialist hostility, with further sanctions and an eventual oil embargo on the horizon. All of this does not discard that there are important choices and changes to be made in terms of government policy, especially in what concerns the repeated appeals, always followed by preferential dollars or credit, to private businessmen, so that they will produce or import. At the end of the day the strength and creativity of the pueblo are the only resource that really matters, and the mobilisation in defence of the revolution, even in the difficult current circumstances, show that the political conscience that was built is perhaps the most important achievement of the past 20 years. And it shows that there is no way forward except to radicalise the revolution. There is a tough battle coming up on May 20, and then another one the following day. (1) With plenty of goodwill we can grant that a strong electoral showing will give Maduro some backing to implement tough measures, but on the other one cannot help but wonder why these tough measures were not put into place in recent months and years. (2) Trying to out-Trump his master, Colombian president Santos announced that he was aware of a months-long evil plan by the Venezuelan “regime” to register and transport hundreds of thousands of Colombians and have them vote! (3) Here we also have to wonder what the “recognition” from the US and its followers is actually worth. We only have to go back a few months to the Honduran elections, where there was a blatant display of fraud, and nevertheless results were “recognised”. The Dawn News / May 18, 2018 – Amid the aggression by the US and its allies, Venezuela is going to poll on May 20. We look back at the Bolivarian Republic’s history, its resistance against imperialism and the achievements of socialism. Alexander Main, NACLA – It used to be generally frowned upon to openly call for military coups and U.S. intervention in Latin America. Not anymore. At least not when it comes to Venezuela, a country where—according to the prevailing narrative—a brutal dictator is starving the population and quashing all opposition. While many ideologues blame “socialism” for the country’s economic ills, most economists point to a set of policy errors that have little or nothing to do with socialism.While many ideologues blame “socialism” for the country’s economic ills, most economists point to a set of policy errors that have little or nothing to do with socialism. Most devastating has been the dysfunctional exchange rate system, which has led to a worsening “inflation-depreciation” spiral over the past four years, and now hyperinflation. Free gasoline and price controls that didn’t work also contributed to the crisis. The Trump administration’s financial sanctions—more than all previous destabilization efforts, which were significant—have made it nearly impossible for the government to get out of the mess without outside help. Sadly, there has been virtually no criticism of U.S. government efforts to topple the Venezuelan government anywhere in the major media.Sadly, there has been virtually no criticism of U.S. government efforts to topple the Venezuelan government anywhere in the major media. In the U.S. Congress, where a large number of legislators now oppose the embargo against Cuba, for instance, there is little outcry, with the important exception of a small group of progressive Democrats who have opposed sanctions against Venezuela, under both Obama and Trump. The majority of the political and media establishment appears to believe that Trump has the right policy agenda for Venezuela, with many liberals pointing to cases of corruption, human rights violations and other crimes allegedly involving Venezuelan officials as justification for harsh measures. When are elections free and fair, according to corporate media? When the US government says they are, writes Alan MacLeod. Fair.org – The May 20 Venezuelan presidential elections pit Hugo Chavez’s successor, President Nicolas Maduro, against opposition challenger Henri Falcon. Maduro has called for the United Nations to observe and oversee the contest. Despite calling for elections throughout 2017, many local opposition groups, together with the US government, have demanded no observers should come, arguing that it would “validate” the elections, and have preemptively decided they will not recognize the victor. The major argument for this declaration is the barring of certain candidates from running, chiefly Leopoldo Lopez. 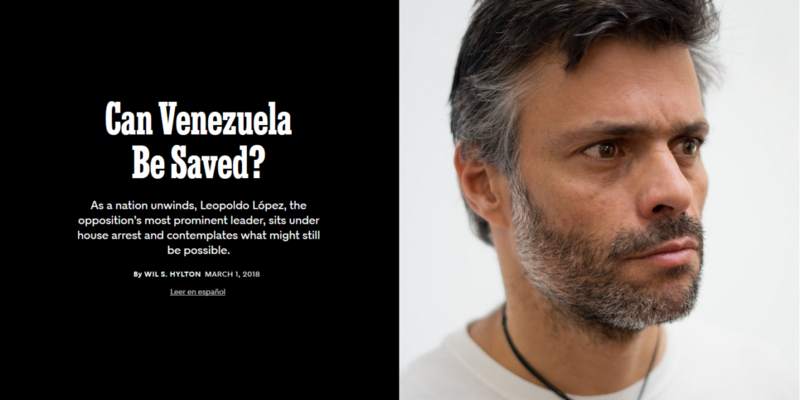 Lopez is under house arrest after being convicted of leading a violent coup attempt against the government in 2014, and was also a key member of the 2002 coup against Chavez; even the State Department has called him “arrogant, vindictive and power-hungry.” Glossing over or simply not mentioning these key details in a 9,000-word puff piece, the New York Times Magazine (3/1/18) presented him as a Christ-like figure, “the most prominent political prisoner in Latin America, if not the world,” comparing him to Martin Luther King. Unsurprisingly, polls show that Mr. Maduro will win this grossly one-sided contest. If by some chance he does not, the regime is unlikely to accept the results. In the history of Venezuela and South American countries, it is often times that the military is the agent of change when things are so bad and the leadership can no longer serve the people. The world would support the armed forces in Venezuela if they decide to protect the people and restore democracy by removing a dictator. Opposition on moral or legal grounds appears low to nonexistent. Previous FAIR studies found that 95 percent of op-eds expressed clear and open hostility to the elected government. Indeed, this is hardly the first time the media have supported a coup in the country. As Bad News From Venezuela catalogs, in 2002 the US trained and backed similar opposition groups, who, after deposing Chavez, then liquidated the Supreme Court, dismissed every elected official and began rounding up and arresting political and media figures who opposed them. With yesterday’s resignation of President Hugo Chavez, Venezuelan democracy is no longer threatened by a would-be dictator. Mr. Chavez, a ruinous demagogue, stepped down after the military intervened and handed power to a respected business leader. Mr. Chavez was a terrible leader. His senseless mix of populist and socialist decrees seriously damaged the economy and galvanized opposition.